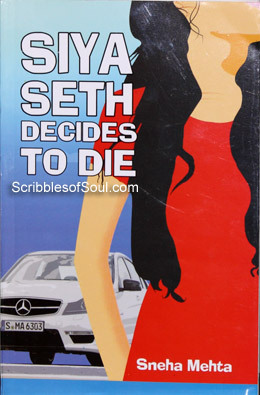 ‘Siya Seth Decides to Die’, the first time I read this title, I was a bit taken aback. For me, death has always been an unwelcome, unwanted, but inevitable reality, be it struggling with the untimely demise of a loved one or the myriad, almost cruel, detailed headlines of the newspapers, briefing about the latest murders or accidents in the town. Whatever the case, I always considered a God’s will behind someone’s death. So, reading a book, written on (as it seems from the very title) the conscious decision of a girl to end her own life, slightly ruffled my curious wings and I gladly accepted the offer to read and review this book. The basic facts first – the novel is written by Sneha Mehta, a student of organizational psychology and a freelance writer and is published by Diamond Pocket Books. Well, needless to say, the above lines evoked sympathy and an unsatisfiable curiosity in me and I plunged head long into this never heard before story. However, for the first two or three chapters, all my search to find out the reasons for Siya Seth’s disgust with her life proved futile. She seemed to be a regular, unabashed, bold girl, coming on terms with the first rushes of adulthood, dealing with the seen and unseen changes in her body and psyche. A smart student, with rich and loving parents, and a best friend Reva to share life’s joys and sorrows. She seemed to be having everything, considered essential in this era, to lead a comfortable life. But, as the story progressed, it became apparent that all is not hunky dory in the life of young, vivacious, motor mouthed Ms Seth. Something is bothering her, forcing her to behave arrogantly and irresponsibly, something slimier, dirtier than the language she uses. And the moment, the secret was revealed through the incoherent dreams and not so subtle hints, I was shocked. This novel is not just a time pass one, showing you the happier and dirtier sides of rich, spoilt kids, but is a novel attempt to unearth one of the most ancient yet hidden, hushed about secrets of family, the presence of a dormant, devilish human tendency, forcing someone to have an incestuous relation with one’s own blood. And, this warped logic forces her to keep her mouth shut, to suffer every living moment and to rush towards death to get the much needed breath. However, all said and done, Siya Seth’s choicest swear words and colorful language makes sure that she loses out on the sympathy, she rightly deserves from the readers. She seems hollow, devoid of emotions, a wooden caricature and despite my best attempts to accept her harrowing situations as the reason for her bad mouthiness and eccentric behavior, she did not impress me as a real girl. Though, there are certain light moments that add colors to the otherwise gloomy canvas. I particularly enjoyed the episodes of Zen’s wedding, Siya’s first date, the fanciful past life therapy and the pot shots, Sneha takes at the Cops, drivers and at life in general, bringing forth the liveliness that is still alive in the otherwise stone-dead, wooden Siya Seth. The novel as a first attempt by Sneha is a humble beginning, though, given her witty comments, interspersed in the novel, providing the much needed comic relief, I would be more than interested to read a light hearted comical offering from her kitty, detached from the dark recesses and deep ravines of the journey called life.